-Who's Afraid Of The Big Bad Bear? The quality of a corporate reporting season should always be judged against the background of market expectations, and general trends in share prices. Every investor worth his salt should know by now profit growth is exploding to the upside, but that's predominantly a mining sector story on the back of significantly higher commodity prices from twelve months ago. Even so, the calendar might suggest we are about two-thirds through corporate results in Australia, fact remains the concentration of corporate releases is very much skewed towards the week ahead. In other words: its still too dangerous to draw any definitive conclusions. Too many reports outstanding can change views and statistics. We'll have to wait until next week to compile a clearer picture. Nevertheless, the general impression thus far is that most companies are living up to expectations and underlying the general trend in profits and forecasts retains a slight upward bias. At least, such are the early, and preliminary, impressions as published by strategists at UBS, Deutsche Bank and Macquarie on Monday. Our own observations here at FNArena are slightly different. Again, any statistics are incomplete, but it remains remarkable that more companies seem to be beating results, but also that more companies seem to be missing the mark. Both percentages to date are potentially en route for setting new records in the short history of the FNArena Market Monitor, in place since 2013. Among those who clearly beat market expectations were CSL ((CSL)), Amcor ((AMC)), Boral ((BLD)), JB Hi-Fi ((JBH)), Nick Scali ((NCK)) and ResMed ((RMD)). Plus two of three big banks that either released financial results (CBA) or a March quarter trading update (ANZ Bank). The latter hasn't been witnessed for quite a while. There have already been plenty of disappointments, of course, and savage share price responses have followed. Disappointments often hide in industry dynamics or underlying organic growth rates, which leaves share prices still vulnerable after financial results came out in line with analysts' expectations. Others simply suffered from the fact that share prices already were at elevated price levels. Observe, for example, how resources stocks have stopped outperforming the broader market even though the sector's corporate performance pushes most others in the shadow. One observation stands out in that some of the quality industrials that had previously been left to the wayside, because they no longer fit in with the new market narrative, have been able to arrest investors' ignorance with their financial results. Apart from CSL and Amcor, Link Administration ((LNK)) also springs to mind, as well as Class ((CL1)), a2 Milk ((A2M)) and Carsales ((CAR)). There is also a growing list of former staple portfolio stocks revealing their weaknesses: Telstra ((TLS)), Brambles ((BXB)), Medibank Private ((MPL)), IOOF Holdings ((IFL)), and Tabcorp Holdings ((TAH)). We could even add Wesfarmers ((WES)) to this list, though the conglomerate from Perth has many more options up the board's sleeves to unlock shareholder value. As per always, there have been the usual punishments, in particular among small cap industrials, where perennial disappointers such as Village Roadshow ((VRL)) remained true to form. All in all, FNArena has been registering twice as many downgrades in stockbroker ratings for individual stocks than upgrades, but this is no surprise given the rally in share prices over the past five months. A more in-depth assessment will be published next week, when the end of the local February reporting season is truly near. Standard & Poor's are responsible for some key, and widely followed, share market indices in Australia. Their next update on exclusions and inclusions is scheduled for Friday, March 10th. Macquarie analysts already offered their educated guess-work with a few insightful angles that might be of interest to those currently owning some of the stocks involved. First up, and this shouldn't surprise: the surge in the Fortescue Metals ((FMG)) share price puts the company firmly inside the Top 50 on the ASX as far as market capitalisation is concerned. Yet, Macquarie doesn't think FMG is about to be added to the ASX50 index. For this to happen, reasons Macquarie, things have to go a lot worse for Seek ((SEK)), which looks like the obvious candidate to lose its spot in the ASX50, but not yet if Macquarie's insight can be trusted. Prospects for change look somewhat brighter for the ASX100 with all of Sirtex ((SRX)), Blackmores ((BKL)) and Navitas ((NVT)) at risk of losing their spot. The analysts observe all three are now below required market cap levels, in particular Sirtex post de-rating. Macquarie lines up an interesting queue of candidates ready to switch places. Evolution Mining ((EVN)) has now become the stockbroker's favourite ASX100 inclusion, followed by OZ Minerals ((OZL)) and Macquarie Atlas ((MQA)). It wasn't that long ago Mayne Pharma ((MYX)) looked like a shoe-in, recall the analysts, but recent share price weakness has pretty much destroyed that story, at least for now. As far as the ASX200 is concerned, Macquarie's gut feel predicts no changes. If there is one, it probably involves the inclusion of Chorus Ltd ((CNU)), New Zealand's prior government owned broadband provider. But who would lose out? It could be Japara Healthcare ((JHC)), but Macquarie's bet would rather be on Sky Network ((SKY)), also operating from across the Tasman. The ASX300 is traditionally more prone to changes and this time might prove no different. Macquarie suggests up to 14 new inclusions could be possible, with eight of these suggestions labeled as either "standout" or "likely". These eight are: Washington H. Soul Pattinson ((SOL)), Inghams Group ((ING)), Propertylink Group ((PLG)), Servcorp Ltd ((SRV)), Mystate Ltd ((MYS)), Superloop Ltd ((SLC)), Ausdrill Ltd ((ASL)) and Mt Gibson ((MGX)). These stocks stand a big chance for being replaced: Cash Converters ((CCV)), Fonterra Shareholders Fund ((FSF)), Alexium International ((AJX)), Donaco International ((DNA)), Paladin Energy ((PDN)), Adairs Ltd ((ADH)), Doray Minerals ((DRM)), MG Unit Trust, otherwise known as Murray Goulburn ((MGC)), Webster Ltd ((WBA)), ERM Power ((EPW)) and Sino Gas & Energy Holdings ((SEH)). The importance of all of the above is that professional funds managers often limit their scope to ASX200 or ASX300 members and this means they'll sell when stocks are dropped from either of these indices. The impact can be magnified when institutional selling occurs against a backdrop of low volumes. In similar fashion, stocks that are newly included can all of a sudden land on institutional investors' radar. And then there are the hedge funds and traders who try to front run what is likely to transpire in case any of these index predictions prove accurate. As such, it shouldn't surprise if some of the stocks mentioned are already trending accordingly. The local reporting season is generating fresh ideas for institutional investors. To back up that statement, look no further than Citi strategists Liz Dinh and Simon Thackray who have been far busier than usual with adding and removing new names to Citi's Focus List Australia/NZ, essentially a selection of conviction calls for the year ahead. The latest addition to the list is South32 ((S32)) with the Citi strategists declaring the share price weakness post interim result has been the result of investors expecting too much capital management too soon. Earlier, Citi mining analysts had told their clientele investors simply have to be more patient as cash will continue to accumulate, and thus rewards shall follow. Citi strategists clearly are backing up that prediction. Prior to South32, Citi strategists added Sims Metal ((SGM)) to the Focus List. Prior to that, both Aconex ((ACX)) and Brambles ((BXB)) had been removed. No doubt, Citi strategists are feeling a little smug since Brambles managed to prolong its bad news cycle with the release of H1 financials, and the removal of previous medium term financial targets. Apart from the two latest additions, Citi's conviction ideas for the year ahead now include AGL Energy ((AGL)), Newcrest Mining ((NCM)), Aristocrat Leisure ((ALL), Star Entertainment Group ((SGR)), Caltex Australia ((CTX)), Santos ((STO)), and MYOB Group ((MYO)). Elsewhere we observed portfolio managers responsible for Model Portfolios at stockbroker Morgans decided to reduce exposure to CSL ((CSL)) post re-rating as risks for Trump to go ballistic on healthcare companies is still seen as tangible and material. Average cash position for the Balanced Model Portfolio has increased to 4%. Morgans' Model Growth Portfolio decided to sell down its stakes in Domino's Pizza ((DMP)), in IPH Ltd ((IPH)), in Star Entertainment Group ((SGR)), and in CSL. Positions were increased in ALS Ltd ((ALQ)) while South32 is a new inclusion. Over at Morgan Stanley, a general reshuffling of Model Portfolios has led to the birth of a monthly updated Australia Conviction List. The inaugural publication revealed the inclusion of ANZ Bank ((ANZ)), Aveo Group ((AOG)), BHP Billiton ((BHP)), Cochlear ((COH)), Domino's Pizza ((DMP)), Evolution Mining ((EVN)), Goodman Group ((GMG)), Graincorp ((GNC)), Insurance Australia Group ((IAG)), InvoCare ((IVC)), James Hardie ((JHX)), Mantra Group ((MTR)), Origin Energy ((ORG)), Rio Tinto ((RIO)), Tabcorp Holdings ((TAH)), TPG Telecom ((TPM)), Treasury Wine Estates ((TWE)), Westpac ((WBC)), WorleyParsons ((WOR)) and Woodside Petroleum ((WPL)). Aconex, post profit warning, and Oil Search ((OSH)), on expected relative underperformance, were removed. Who's Afraid Of The Big Bad Bear? Market speculation is rife about when exactly giant international retail disruptor Amazon will be opening its doors in Australia, so to speak, and what kind of impact, devastating or not, this might have on the likes of Harvey Norman ((HVN)), RCG Corp ((RCG)), Premier Investments ((PMV)), and others. But every Internet shopper in Australia already knows there is a dot com dot au Amazon market place where products can already be purchased in exchange for local dollars. Differences with the US-based Amazon website remain prominent, however. 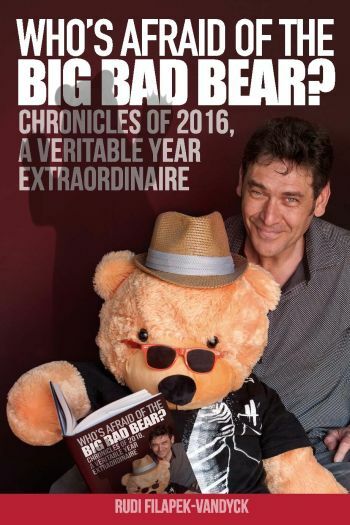 This also includes the availability of my latest book, Who's Afraid Of The Big Bad Bear? The Australian Amazon allows the purchase of eBook version only, while foreign Amazon websites also offer the paperback version. It's an antiquated legal thing, originally meant to protect local content. Paying subscribers should note a free copy in pdf is included in 6 and 12 months subscriptions. Look up "Special Reports" on the brand new FNArena website, where you'll also find prior publications, as well as PowerPoint slides of my on-stage presentations. In partnership with Queensland based Vested Equities, FNArena manages an All-Weather Model Portfolio based upon my post-GFC research. The idea is to offer diversification away from banks and resources stocks which are so dominant in Australia, while also providing ongoing real time evidence into the validity of my research into All-Weather Performers. Your Editor has been invited to present at the Australian Shareholders Association's (ASA) 2017 Securing Your Investing Future Conference to be held at the Grand Hyatt Melbourne from 15-16 May. (This story was written on Monday 20th February 2016. It was published on the day in the form of an email to paying subscribers at FNArena). How Long The Buyers’ Strike?